For those of you aiming to pick up an Xbox One this fall, today we’re adding another pair of options to our existing holiday bundle lineup. 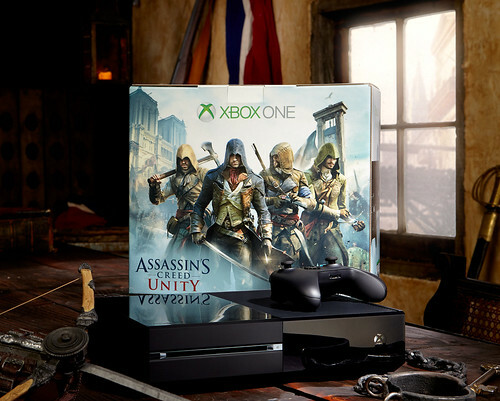 In partnership with Ubisoft, we’re offering two new exclusive Xbox One bundles, both featuring Assassin’s Creed Unity. Available at select retailers beginning Sunday, November 2nd, both the Xbox One Assassin’s Creed Bundle ($399 USD) and Xbox One Assassin’s Creed Bundle with Kinect ($499 USD) also include a copy of Assassin’s Creed IV: Black Flag. Encased in special edition Assassin’s Creed Unity packaging, the Xbox One Assassin’s Creed Bundle will include a standard Xbox One console, wireless controller and chat headset, one month Xbox Live Gold membership and a digital download code for the highly anticipated Assassin’s Creed Unity, which will be available for pre-download and ready to play on November 11. The Xbox One Assassin’s Creed Bundle with Kinect will also include a standard Xbox One Kinect sensor and a copy of Dance Central Spotlight.